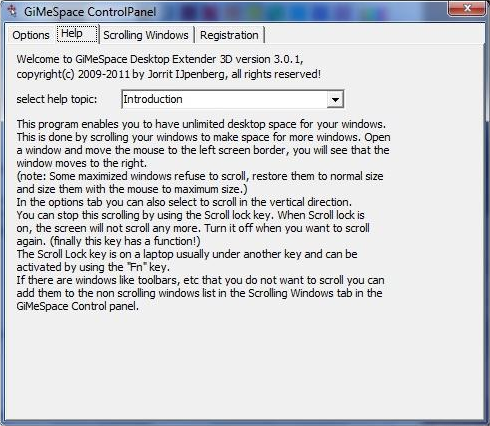 GiMeSpace Desktop Extender 3D is a scrolling virtual desktop manager that not only gives you more desktop space, but also lets you resize windows without limitation! With GiMeSpace Desktop Extender 3D, you'll be able to enjoy the panning function from Windows XP, but in your new Windows 7, Windows 8 or Windows 10 desktop. Or, you can limit the size of your virtual desktop to the space that is used by your application windows. Plus, with GiMeSpace Desktop Extender 3D, you'll be able to scroll left and right, up and down, but also IN and OUT, seamlessly! Whoa. Ruminate, for a moment, on the implications of this. Navigating your desktop in three dimensions means that you can zoom in to see more detail, or zoom out to see the big picture. The best part? You can still work with your windows even if you're zoomed in or out! After you purchase GiMeSpace Desktop Extender 3D it may be used indefinitely. GiMeSpace Desktop Extender 3D is licensed per computer, and not per user. Upgrades to future versions of the software will be free up to the next major version and minor versions thereafter. For versions after that, upgrades will require additional payment, which will be discounted by 40%. “What can computer users do if they need more desktop space? They could buy a second monitor to run a multi-monitor setup or they could run a virtual desktop software to switch between multiple desktops with shortcuts or the mouse. GimeSpace has a different solution, which is a mix of a multi-monitor system and virtual desktops. Please email a support request to gimespace gimespace.com with your order ID and we will fix this for you. Edward Smith Just ordered and received the key, but the key is not valid. Edward Smith HJ B, I have the exact same problem you had (I hope they have fixed your issue by now). It says that I have 0 days left on the trial and when I enter the key it says that it is an invalid key. I do not remember ever having GiMeSpace on any computer that I have owned. Very strange. Constantin Florea @Edward Smith, I've just contacted the vendor regarding the issue you mention. Edward Smith Thank you. I have not heard from them yet. I did email directly as well. I appreciate your help. Jorrit IJpenberg There was a mix-up with the license key list. A new key has been send. Edward Smith Works perfectly, thank you. Nice program. I am using it with Display Fusion and it works fine on a windows 10 system. My only issue so far is that if I bring my cursor to the bottom to get something on the tool bar, the program that I am working on will shift up a little. I will have to shut off top scroll I think. Jorrit IJpenberg Yes, Sometimes windows are a bit higher then the screen. 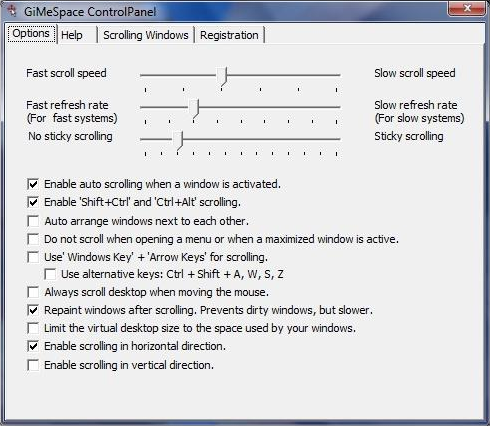 Selecting only horizontal scrolling is a very common way to use this program. 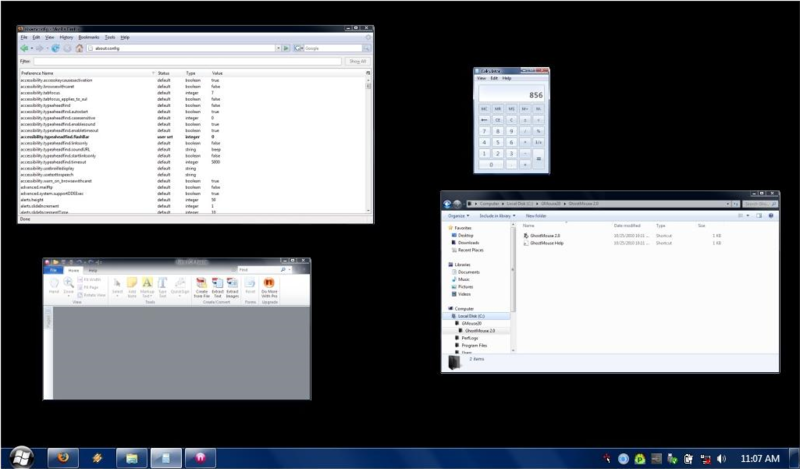 Other alternative is to set a fixed virtual desktop size or not maximize windows but size them manually to full screen.